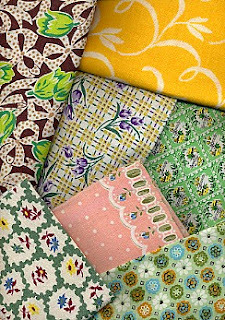 Love Forever has a great piece today about feedsack fabric, something that I previously knew nothing about (growing up in the suburbs without a crafty grandma around). I have a gorgeous feedsack skirt with vintage hand-made lace from rural Wisconsin creators blindhen and it is probably my most prized piece of clothing. I love this bit of American textile history, if only more companies (and consumers) today put that kind of thought into the life of a product's packaging.